This article is about the food. For the roller hockey team, see Buffalo Wings (inline hockey). A Buffalo wing, in the cuisine of the United States, is an unbreaded chicken wing section (flat or drumette) that is generally deep-fried then coated or dipped in a sauce consisting of a vinegar-based cayenne pepper hot sauce and melted butter prior to serving. 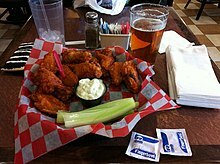 The Buffalo wing was invented in 1964 at Anchor Bar in Buffalo, New York by Teressa Bellissimo. They are traditionally served hot, along with celery sticks and carrot sticks with blue cheese dressing for dipping. Buffalo wings have gained in popularity in the United States and abroad, with some North American restaurant chains featuring them as a main menu item. The name "Buffalo" is now also applied to other spiced fried foods served with dipping sauces, including boneless chicken "fingers", chicken fries, chicken nuggets, popcorn chicken, and shrimp. It also describes other dishes, such as pizza, that are seasoned with the Buffalo-style sauce or a Buffalo flavor seasoning. Although an article published about the Anchor Bar in a local newspaper during 1969 does not mention Buffalo wings, a local competitor of the Anchor Bar, Duff's Famous Wings, began selling Buffalo wings in that year. Another claim is that a man named John Young, who moved to Buffalo from Alabama in 1948, began serving uncut chicken wings that were breaded, deep fried and served in his own special tomato based "Mambo Sauce" at his Buffalo restaurant beginning in 1964. Prior to opening his restaurant he had a conversation with a boxer who traveled and in a later interview Mr. Young recalled: "He told me that there was a restaurant in Washington, D.C. that was doing a good business with wings and I decided to specialize". In the same interview Young stated that the Anchor Bar didn't offer Buffalo wings as a regular menu item until 1974. He registered the name of his restaurant, John Young's Wings 'n Things, at the county courthouse before leaving the Buffalo area in 1970. In 2013, at the National Buffalo Wing Festival, held in Buffalo, New York, John Young's contributions were acknowledged when he was inducted into the festival's National Buffalo Wing Hall of Flame. In 1977 the city of Buffalo issued an official proclamation celebrating Anchor Bar co-owner Frank Bellissimo and declared July 29, 1977 to be Chicken Wing Day. Throughout the 1970s and 1980s Buffalo wings gained in popularity as a bar food and appetizer across the United States and Canada. Large franchises specializing in Buffalo wings have emerged, notably Buffalo Wild Wings founded in 1982 and Hooter's in 1983. McDonald's began selling Mighty Wings as an optional item in 1990 at their restaurant locations in the United States. In 1994, following four Super Bowl appearances by the Buffalo Bills football team, the Domino's pizza chain added Buffalo wings to their national menu, followed by Pizza Hut the next year. As the market for chicken wings became larger, restaurants began to create and use a variety of sauces in addition to buffalo sauce. Some of these new chicken wing sauces were influenced by Chinese, Japanese, Thai, Caribbean, and Indian cuisines. Other flavors created by restaurants include unique combinations, such as Blueberry BBQ Wing Sauce and Maple/Bacon Glaze for example, to help keep customer interest and grow their businesses. Because of the increased cost in the price of chicken wings, and a desire by some diners for a neater eating experience, restaurants began to offer a menu item called "boneless wings," sometimes marketed under the name wyngz. Boneless wings are essentially small pieces of skinless, boneless chicken breast that are coated in flour and spices then fried or baked. They are usually coated in or served with similar sauces as chicken wings. The growth of popularity in recent years in Buffalo wing consumption and restaurants serving wings have led to actual and perceived shortages of chicken wings in the United States during certain times. In many areas of the United States chicken wing festivals are held with Buffalo wings being used in competitive eating events, such as at Philadelphia's Wing Bowl and the National Buffalo Wing Festival. It has also become commonplace for restaurants to offer a wing eating contest featuring a customer eating a certain number of wings, coated in their hottest sauce during a set period of time. Many bars and restaurants intentionally create an extra-hot sauce for this purpose, and customers are usually rewarded with their picture posted on the restaurant's wall or website, a commemorative T-shirt, a free meal or a combination of rewards for successfully completing the challenge. The chicken wings used for Buffalo wings are usually segmented into three parts: drumette, flat, and flapper or pointer, the last of which is discarded. Typically, the wings are deep-fried in oil, without breading or flour until they are well browned. Alternatively, they may be baked, grilled, or broiled. Cayenne pepper, hot sauce and melted butter or margarine are the base of the Buffalo wing sauce, which may be made mild, medium, or hot. Commercial ready-to-use wing sauce is made with varying levels of spiciness. The cooked chicken wings are placed in a bowl or pot and shaken to coat the wings completely covering them in sauce before serving. Traditionally, Buffalo wings are usually served with small sticks of celery and blue cheese dipping sauce on the side. Ranch dressing, however, is the most popular wing dipping sauce in the United States and wings are often served with sliced carrots or whole baby carrots. ^ Nicks, Denver. "Who Actually Created Buffalo Wings?". The Daily Beast. Retrieved April 30, 2017. ^ O'Shaughnessy, Caitlin M. "What is the Difference Between Hot Wings and Buffalo Wings?". Chowhound. Retrieved April 30, 2017. ^ Horwitz, Jeremy (January 1, 2008). "Chicken Wings, or, Why people Know About Buffalo". Buffalo Chow.com. Archived from the original on December 31, 2009. Retrieved November 18, 2009. ^ "Chicken Wings – A Hot Topic! New 2012 Wing Report!". National Chicken Council. Retrieved April 30, 2017. ^ Birdsall, John. "America, You're Getting Two-Thirds of the Hot Wing". Chowhound. Retrieved April 30, 2017. ^ Suddath, Claire. "A Brief History of Buffalo Wings". Time.com. Retrieved April 30, 2017. ^ Horovitz, Bruce (October 8, 2009). "Spicy buffalo flavors stampede into gobs of new food products". USA Today. Retrieved April 30, 2017. ^ Banfield, Kelsey. "17 Hot & Spicy Buffalo Sauce-Flavored Foods". babble.com. Retrieved April 30, 2017. ^ a b c d e Harmon, John E. "On the Wings of a Buffalo or "Mother Teressa's Wings"". Atlas of Popular Culture in the Northeastern United States. Retrieved January 20, 2008. ^ a b c d e f Trillin, Calvin (August 25, 1980). "An Attempt To Compile A Short History of the Buffalo Chicken Wing". The New Yorker Magazine. Retrieved January 22, 2008. ^ a b Peggy Trowbridge Filippone. "Buffalo Wings History - The origins of Buffalo Chicken Wings". About.com. Retrieved January 20, 2008. 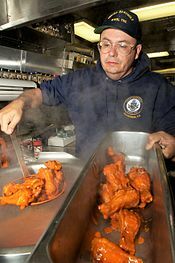 ^ "AnchorBar - Origins of the original Buffalo Chicken Wing". AnchorBar.com. Archived from the original on January 29, 2008. Retrieved January 6, 2008. ^ Galarneau, Andrew Z. (March 1, 2014). "At 50, the Buffalo-style chicken wing has conquered the world". The Buffalo News. Retrieved May 1, 2017. ^ Clemens, Chris. "Duff's Famous Wings – Buffalo, NY". ExploringUpstate.com. Retrieved May 23, 2017. ^ a b c Okun, Janice (February 6, 1996). "John Young Stakes His Claim To The Chicken Wing". The Buffalo News. Retrieved May 4, 2017. ^ "James Beard Foundation". THE 2003 JAMES BEARD FOUNDATION COCA-COLA AMERICA'S CLASSICS AWARDS. Archived from the original on January 3, 2008. Retrieved January 20, 2008. ^ "Buffalo Wing Hall Of Flame John Young "Wings and Things"" (PDF). National Buffalo Wing Festival. Retrieved May 4, 2017. ^ Claiborne, Craig; Franey, Pierre (August 30, 1981). "Food; Winging It In Buffalo". The New York Times. Retrieved April 30, 2017. ^ Harmon, John E. "On the Wings of a Buffalo or "Mother Teressa's Wings"". Atlas of Popular Culture in the Northeastern United States. Retrieved May 1, 2017. ^ Carlyle, Erin (March 9, 2011). "Buffalo Wild Wings and the triumph of the chicken wing". City Pages. Retrieved May 5, 2017. ^ Sozzi, Brian (April 30, 2016). "McDonald's Brings Back Mighty Wings". The Street. Retrieved May 5, 2017. ^ Stromberg, Joseph. "A Brief History of the Buffalo Chicken Wing". Smithsonian.com. Retrieved April 30, 2017. ^ Upton, Emily. "Why Buffalo Wings Are Called That". Today I Found Out. Retrieved April 30, 2017. ^ Brox, Denene. "Winging It". QSR. Retrieved April 30, 2017. ^ Brownell, Claire. "Why the once worthless chicken wing is now worth billions". Financial Post. Retrieved April 30, 2017. ^ "Our 33 Best Asian-Inspired Finger Food Recipes". Saveur. Retrieved April 30, 2017. ^ Cansler, Cherryh. "Now trending: Why unique chicken wing flavors are hot". Fastcasual.com. Retrieved May 3, 2017. ^ Myers, Dan. "We Need to Come Up With a Better Name for Boneless Wings". The Daily Meal. Retrieved May 3, 2017. ^ Neuman, William. "'Boneless' Wings, the Cheaper Bite". The New York Times. Retrieved April 30, 2017. ^ Bennett, Dashiell. "Chicken Wing Shortage Threatens To Destroy Super Bowl". Deadspin.com. Retrieved April 30, 2017. ^ Yglesias, Matthew. "The Great Chicken Wing Shortage of 2013". Slate.com. Retrieved April 30, 2017. ^ Taylor, Kate. "Don't Panic:There Will Definitely Be Enough Chicken Wings for the Super Bowl". Entrepreneur.com. Retrieved April 30, 2017. ^ "Wing Festivals Across America in 2015". Bring the Wing.com. Retrieved May 3, 2017. ^ "Chicken Wing-Eating Competitions Across America". Retrieved August 24, 2015. ^ "Wing Eating Challenges in Restaurants Across America". Bring the Wing.com. Retrieved April 30, 2017. ^ Barrow, Cathy. "These wings are called 'irresistible' for a reason". The Washington Post. Retrieved September 17, 2017. ^ Pittman, Christine. "What's the Difference Between Hot Sauce and Wing Sauce". The Cookful. Retrieved April 30, 2017. ^ Zimmer, Erin. "Taste Test: Buffalo Wing Sauce". Serious Eats. Retrieved April 30, 2017. ^ Saladino, Emily. "Why Do We Eat Celery with Buffalo Wings?". Tasting Table. Retrieved September 17, 2017. ^ "Ranch Is The Most Popular Wing Dip (POLL)". Huffpost. Retrieved September 17, 2017. Wikimedia Commons has media related to Buffalo wings.